The water in your home can contain impurities that affect the clarity, taste, smell, and safety of the water you drink. Water can contain dirt, rust, chlorine, or water-hardening minerals, which can cause health issues, damage to your refrigerator, and leave your water and ice cloudy and undrinkable. A good fridge filter, like the Samsung DA29-00020B uses a block of activated carbon to capture these pollutants, giving you healthy, clear, great-tasting water and ice. 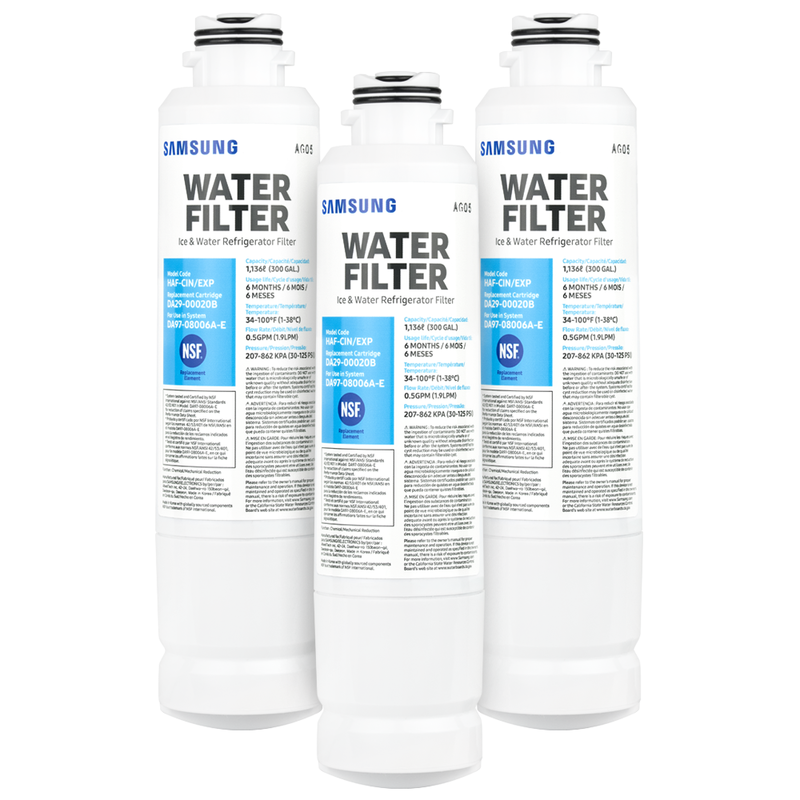 The Samsung DA29-00020B filter is used in a number of refrigerators by Samsung, and is rated NSF/ANSI 42 and 53, which certifies that this fridge filter removes chlorine, cysts, asbestos, benzene, sediment, sand, and many other pollutants. 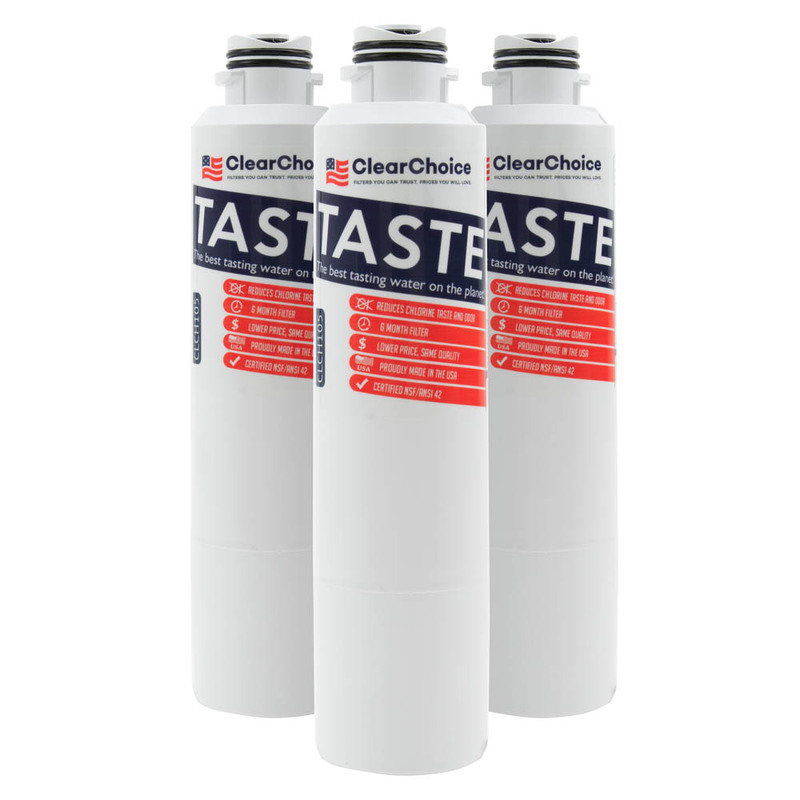 fridge filter - the manufacturer's OEM Samsung Aqua Pure Plus model, the Clearchoice clch105. All filters come with a one-year satisfaction guarantee. The ClearChoice CLCH105 filter replacement for the DA29-00020B provides the same quality filtration as the OEM model at a fraction of the price. Our recommended model is the CLCH105. All filters should be changed every six months. All of our discount filters come with free shipping and free, no hassle returns. Consult your owner's manual to determine change frequency and the proper changing procedure. Other popular fridge models that can replace the DA29-00020B are 9101, HAF-CIN, HAF-CIN-EXP, DA29-00020A, FMS-2, DA29-00019A, EFF-6027A, HAFCIN, WSS-2, WF294 and more. 49 compatible alternative filter models below. Marvel at the specifications of our DA29-00020B compatible filters. The DA29-00020B Samsung filter removes many contaminants from your water like chlorine, lead, and other unwanted minerals that could potentially be harmful to your health. The OEM Samsung DA29-00020B replacement has been tested and certified to pass NSF/ANSI Standard 42 and Standard 53, meaning it has been certified to purify your water of chlorine and other impurities. The aftermarket ClearChoice CLCH105 and Ready Filters WF-1110A filters are a compatible replacement with many of the same features as the Samsung DA29-00020B, but at a much lower price. Don't let the price fool you, however. 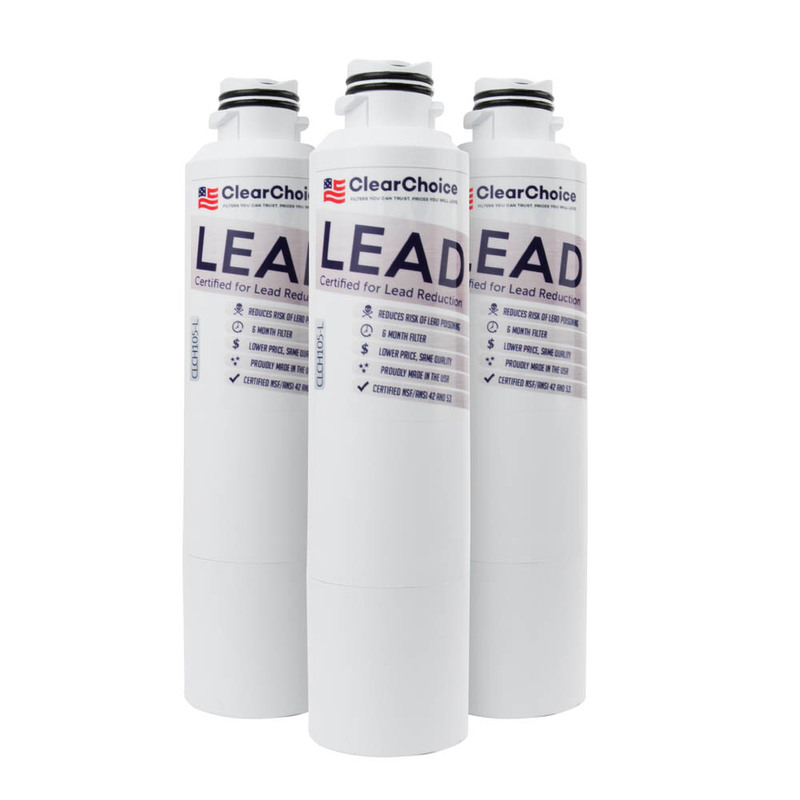 The ClearChoice and Ready Filters has comparable filtering abilities to the OEM. We recommend the aftermarket filters due to their lower pricing and their excellent filtration. The primary difference between the OEM and aftermarket filters is price and NSF/ANSI ratings, though some non-NSF/ANSI rated filters are still constructed with NSF/ANSI rated parts. As always get free shipping and returns on all discount filters. We needed to replace the filter in our refrigerator but were hesitant because of the price of the name brand filter. We found these on line and decided to try them. We were worried that they wouldn't work as well or wouldn't fit right but none of that was true. They fit and work perfectly and saved us a lot of money. We will never pay full price for a water filter again! These replacement filters are great!, I've already told family members/co-workers, and friends about the ease of installation and of course the price. I will be purchasing filters from this website well into the future. I was at my fiance's townhome when a large chain store repair person replaced the filter on her Kenmore refrigerator and it was more than twice the price of 2 replacements from this company.